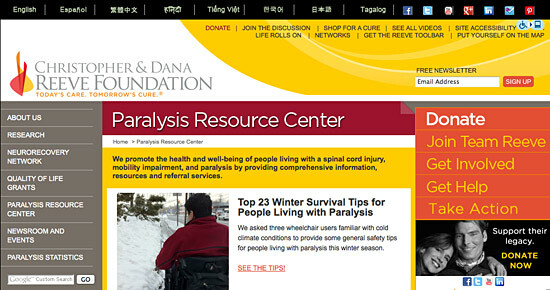 Wide use of social media by the Christopher & Dana Reeve Foundation. According to a study by Blackbaud, NTEN and Common Knowledge, over 92 percent of nonprofit organizations have a presence on at least one social networking site, but most raise very little money through their social activity. In fact, 87 percent have raised under $1,000 on Facebook since they began using the platform. A big part of what holds nonprofit organizations back is the fact that they can’t risk full-fledged social media adoption because they’re short staffed and must focus on creating revenue and running programs — helping real people in the real world. Yet despite the lack of widespread fundraising success, social media is clearly a hot topic in the nonprofit space. Conferences dedicated to helping nonprofits learn how to leverage social media for social good are popping up. Big social fundraising days coupled with workshops and other training events are taking advantage of the groundswell of social fundraising activity. And large online publications like Mashable are even covering social media for social good. 89% of nonprofits use Facebook while 57% use Twitter — and more than half have no formal budgets for social networks.